Tuesday 13 August 1946 was a very special day in the history of Appita, for it was on that day that Mr S A Clarke, Chief of the Division of Forest Products at the then CSIR, presided over a meeting in Launceston, Tasmania, of leaders from the paper manufacturing companies and CSIR, who took the decision to form a technical association and elect an interim committee. Mr G W Ellis, of APM, was elected chairman, and the Committee comprised two representatives of each company – Associated Pulp and Paper Mills Ltd (APPM), Australian Newsprint Mills Pty Ltd (ANM), Australian Paper Manufacturers (APM) and the Division of Forest Products, CSIR. Appita’s history is closely associated with the history of the industry, and it was not until the late 1930’s that the pioneering work of Ian Boas, Lou Benjamin and others led to the commercial pulping of eucalypts, at APPM Burnie and APM Maryvale, closely followed by ANM Boyer. Consequently when Appita was formed in 1946 much of the Australian process technology was of recent development and integrated pulp and paper manufacture wasin its infancy. It is no coincidence therefore that Appita grew from the annual CSIR Division of Forest Products Pulp and Paper Cooperative Research Conference. Appita was founded in Launceston in 1946. At the Launceston Conference in 1982 the then Appita President donated a plaque to the City of Launceston to commemorate the 1946 event. The plaque is embedded in the brick wall on the right hand side of the Brisbane Arcade, just off the Brisbane Street Mall. 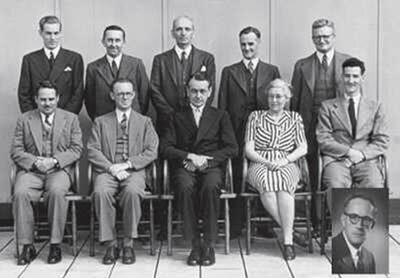 Appita Interim Executive Committee, 1947-48. The provisional committee set up on 13 August 1946 agreed on a number of objectives, each of which are still in place today. They considered grades of membership, fees, and administrative matters. Their tasks, following the meeting were to prepare a constitution, build up membership and organise the first Annual General Meeting and technical conference. This was held in March 1947 in Melbourne, by which stage the association had 196 individual members of whom 65 attended the first AGM. The association grew quickly. In its first year of office the Interim Committee set up much of the organisational framework which survives today – local Sections, Special interest Groups and Administrative Committees. Contacts with sister associations were made and Company Membership increased, the association becoming international with the inclusion of New Zealand Forest Products. 20 Sustaining Members came onboard. Individual membership grew to 265. The Proceedings of the First Annual Conference were published along with a quarterly Newsletter, and these publications were combined in 1957 to form Appita Journal. By its 25th birthday, Appita had over 1000 individual members, 15 company members and 18 Sustaining Members, and today we have 1300 individual, seven company and 92 Sustaining Members. While the Executive Committee is charged with managing the affairs of the association, a key administrative position is that of Secretary. In its lifetime Appita has had only eight Secretaries – G H Wiltshire (1947 –1948), E P O’Leary (1948 – 1950), R W Smith (1949 – 1957), I G Taylor (1957 – 1966), F M Hunter (1966 – 1973), D F Lampard (1973 – 1987), P W Brown (1987 – 1999), R S Coghill (1999-2009) and Adele Elice-Invaso (2009 to present). Until Frank Hunter’s time the position was honorary. Frank Hunter and Don Lampard were known as Secretary-Treasurer, and during Don’s term of office the broader responsibilities of the position were recognised by the change of title to Executive Director. The infant association of 1946 needed a ‘home’, and this was generously provided by CSIR Division of Forest Products, which had major laboratory facilities in South Melbourne. Appita was provided with an office, telephone and free-of-charge secretarial assistance. By the beginning of 1947 the secretarial workload had risen to the point where a full-time assistant was required. Miss C M Wright, previously at CSIR, accepted the position and became Appita’s first employee. She remained in that position until 1954. By then the needs of a growing association had outstripped office size and a Sustaining Member, A P McLean, generously provided rent-free office space at 476 Collins Street Melbourne. In 1968 the National Science Centre was established at the new Clunies Ross House in Parkville, and Appita was one of 32 associations to transfer their head quarters there. Once again our expanding interests outstripped the available accommodation and Appita purchased its present office in the Carlton Clocktower in 1996. Melbourne’s outstanding real estate price growth has made this sound investment a most valuable one for Appita, allowing us to maintain a high level of services to members at minimum cost, thus honouring our status as a genuinely not for profit association. From Appita’s beginnings there was interest in what was happening from across the Tasman, and NZFP joined as a Company Member in 1947. Individual Members from New Zealand slowly followed suit and by the second year there were only five New Zealand members and seven from other countries. The other New Zealand companies joined, however, and were active Testing Committee participants. The first New Zealand Conference was held in Rotorua in 1957, with 204 delegates including 65 from Australia. There have been 13 Conferences in New Zealand, and they are now held there every third year, the next being in 2011. The ‘Auckland Province’ Local Section was formed in 1961 following concerns that a separate New Zealand technical association might be formed. In 1962 it was decided to remove Australia from the name of APPITA, and so a plebiscite of members voted to change the name to the ‘Australian and New Zealand Pulp and Paper Technical Association’, or Appita for convenience, and that name is now the legal name of the association. That move strengthened the ties between the countries and membership from New Zealand grew quickly. A New Zealand secretariat office was established in 1986.